.…he poured out his uncanny voice: a preternaturally sustained, androgynous croon, steeped in melancholy and awe. 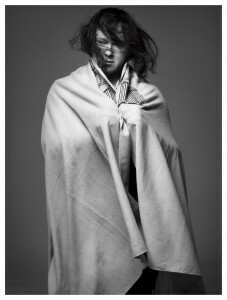 Antony Hegarty (b. UK. 1971) is a composer and visual artist, best known as the lead singer of Antony and the Johnsons. He grew up in California and moved to New York in 1990, where Antony and the Johnsons built a cult following, and where Antony received a New York Foundation for the Arts Award (NYFA) for “performance art/emergent forms”. In 2000 the group’s debut album Blue Angel highlighted Antony’s soulful, multi-octave vocals. He went on to appear on two Lou Reed albums, touring with him in 2003. The band’s second full-length album, I Am a Bird Now was released in 2005, and won the UK Mercury Prize. In January 2012 Antony and the Johnsons were commissioned by The Museum of Modern Art to perform Swanlights at Radio City Music Hall. The performance was a collaboration with laser artist Chris Levine and set designer Carl Robertshaw, and incorporated a 60-piece orchestra. It was hailed a triumph by the New York Times. Recently the Southbank Centre in London announced that Antony is to direct Meltdown 2012 – an honour bestowed on some of the world’s most distinguished musicians including Nick Cave, John Peel, Laurie Anderson, Patti Smith, David Bowie and Ray Davies.